The awful winter weather had abated enough for the football to get back underway and for the first time in months there was a full fixture list played in the First Division. For Burnley it was the first post-McIlroy game. We'd lost a week earlier at Sheffield United with the inside forward on the transfer list but when we took to the field against West Ham at Turf Moor it was our first game since the sale of the Irish international. All the discussions ahead of the game were about the potential attendance with many Burnley supporters pledging never to go on Turf Moor again because of the sale of McIlroy. The fact is, the attendance was down. It was 17,197 and was the lowest of the season to date. It was over 3,600 down on the previous home league game against Sheffield Wednesday, but that was a Christmas game so perhaps a fairer comparison, opponents and timing wise, is with the Ipswich game played in early December which had attracted 19,498 and had been the previous lowest. Interestingly, in the match report for the game, Keith McNee, in the Burnley Express, opened up with comments on the attendance as below. 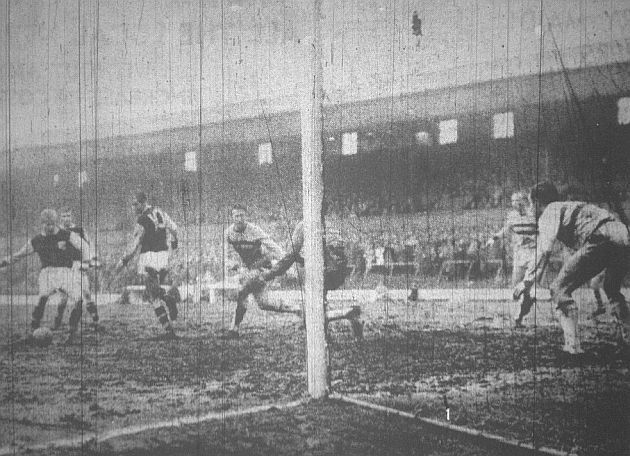 Despite the McIlroy furore, the atrocious weather, the long lay-off due to the freeze up (which has probably slipped some enthusiasm from the fans), and the fact that Burnley are out of the FA Cup, there were still more than 17,000 spectators at Turf Moor to see the McIlroy-less Clarets. It was the lowest attendance for a league game at Burnley since April 1961 and the smallest of this season by about 2,000, but even so club officials must have been delighted because in all the circumstances it was an excellent 'gate'. Especially when compared with those other First Division clubs over whose heads no club-or-player controversy has been raging for the past fortnight - only 18,000 for instance in a city as big as Birmingham for the 'derby' with Wolves, little more than 11,000 at Leyton Orient, only 10,000 at West Bromwich and 8,000 at Fulham. Some supporters have stated that they will not be going to Turf Moor again in protest over Burnley's attitude to McIlroy. But my view is that the gates will soon be back to a near-average figure and those fans who kept faith with the club on Saturday came away favourably impressed with what they had seen. McNee referred to it being the smallest attendance since April 1961. 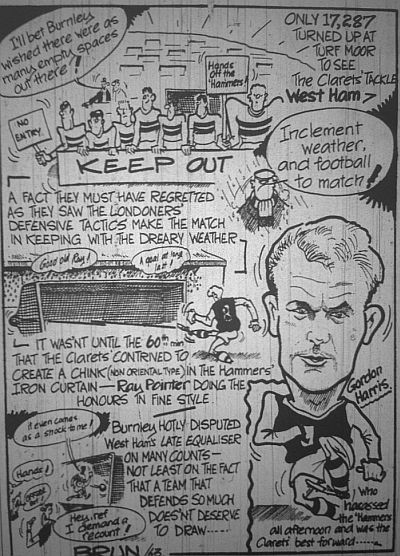 That too was for the visit of West Ham and attracted only 11,609 spectators as the 1960/61 season was drawing to an end. In 1963, the 17,197 saw Burnley draw 1-1 but very unfortunate not to win the game. Burnley took the lead on the hour. Andy Lochhead made a run down the right, got to the line and pulled the ball back. It seemed to have gone too far but Gordon Harris got it back across the face of goal. Jimmy Robson totally missed his kick but Ray POINTER followed up to neatly shoot into the corner of the net. It was a special day for Pointer. It was his 200th appearance for the club and as was traditional at the time he captained the team. A win looked likely until four minutes from the end when BYRNE converted a Sealey cross. For McIlroy it was not a good day. He made his Stoke debut against Norwich at Carrow Road but his new team came home having suffered a 6-0 hammering. And I'm sure Bob Lord enjoyed another result. Our reserves travelled to the Victoria Ground to face Stoke and came home with a 2-0 win courtesy of two goals from prolific goalscoring youngster Willie Irvine. It was a new era for Burnley and the last word is with McNee and the Burnley Express. You cannot take a player of McIlroy's class and ability out of your side and not expect to feel the pinch - even if the player concerned has not been producing performances of the required standard. That is not to say that Burnley can't stay at the top without McIlroy. I am convinced that they can, but nevertheless this team is going to need time to reorganise and readjust itself. Mac has gone and it is no fault of those who remain, and they deserve a break from the fans. Let's be honest about it, over the years Burnley have relied on McIlroy's inspiration so much it must be very strange for his ex-colleagues not to have him around. They need, and deserve, the time to prove what they can do without him.